Oh no, not another one of those GoodNites disposable bed mats reviews! Before your child’s enuresis alarm finally works, you’ll spend every morning cleaning up smelly mattresses and blankets. Thanks to disposable bed mats, cleanup is effortless and time-saving. 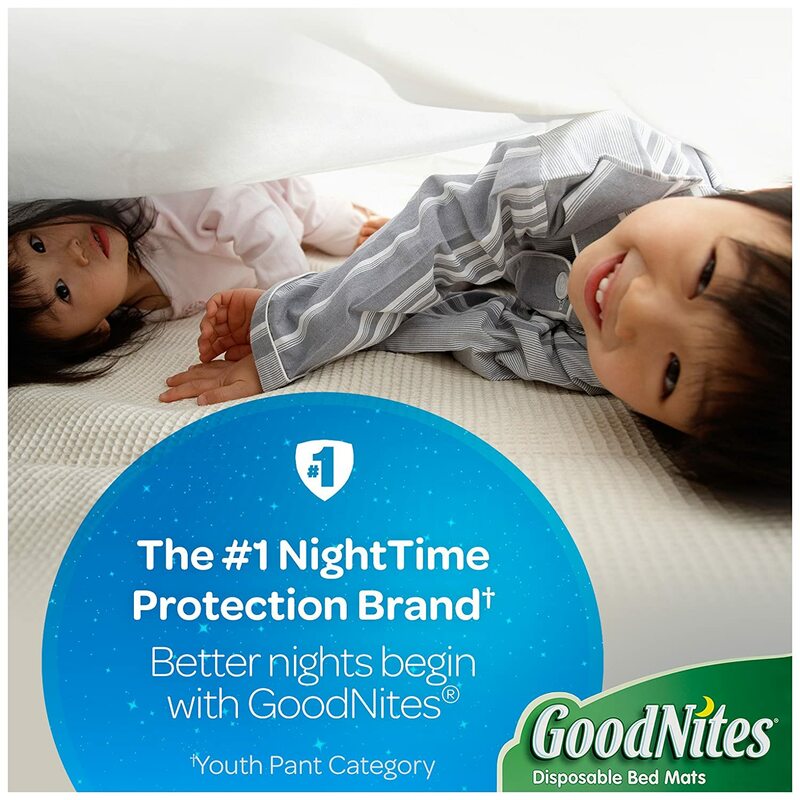 One of the most popular brands of disposable mats is GoodNites. All good in theory, but does this brand deliver its promised results? Only parents who bought one previously can tell us all for sure. For that, we give you this GoodNites bed mat review. Briefly, we give you a rundown of the GoodNites bed mats‘ top features. GoodNites like to attribute it to what they call “Micro-Pocket Technology,” a feature that locks in odor and absorb as much fluid to keep the whole mat dry. With this technology, these GoodNites disposable bed mats are equipped with a “super-absorbent core and leakage barrier” that protects your mattress and sheets. This technology is the same as what the GoodNites Bedtime Pants has. It’s made of polypropylene. Overall, it should be rustle-free. There are 4 adhesive strips to ensure these mats remain in place throughout the night. Are they happy? Here’s what previous buyers have to say about these disposable incontinence mats. – Performance. These mats do keep the bed dry. One person has described the absorption capability of these GoodNites bed mats to be “not sweaty,” which is very important because aside from the wetness (or moisture), we want our children’s bed to be as odorless as possible. These mats also don’t leak. It’s also very simple and quick to change these mats, which is another plus, especially if you have to do it in the middle of the night and would love to go back to sleep as quickly as possible. – Other Positive Comments. These disposable mats are not just for kids. Because they’re large enough, they’re also great for adults. They’re also useful as an infant changing pad. – Limitations. One of the biggest disadvantages of these mats is their adhesive. Apparently, they stick to blankets and sheets really well. However, you’ll have problems taking them out if you use fleece sheets. Yes, they do work in protecting your bed from leaks and odors. Also, these GoodNites bed mats are large enough to be used by adults. The only disadvantage is that they’re very sticksy so they might ruin your sheets.